Strengthening family, faith and building relationships that are built on honesty, transparency and filled with warm-hearted candor. Treating people the way you want to be treated! People First to me means making customer service a priority. When I look around this office I see a team that is dedicated to finding solutions that help all of our customers work through their issues to obtain the financing they need. I saw an example of this when I took Atlantic Ave Staffing from Stephanie. She really listened to Pat talk about how her biggest debtor was crucial to her business, so Stephanie communicated with Crestmark several times and worked to build up a payment history so that we could provide the funding she needed. I always see Stephanie going the extra mile for our customers, and she sets a great example for me on how to put people first. 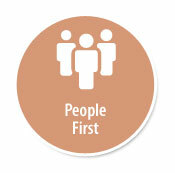 To me, “People First” is at the heart of what we do. For many years Sterling has developed partnerships with our clients that run deep. To me, our clients are our biggest asset and each client is distinctively different. Our priority is to build a relationship founded on trust and respect and an understanding of what each party needs and expects from each other. Through putting our clients first, we build a relationship getting to know our clients and their world. We are able to develop solutions uniquely tailored to that specific client and hopefully provide them with a competitive advantage they need to succeed within their own industry. The only way we can do this is to put people first, to get to know them, to understand their culture and their needs. What makes Sterling different than other finance companies is the amount of time we spend getting to know our clients. I have heard our CEO say this on almost every prospect call, “Sterling is a 52-week touch program.” This rings so true and is what makes us different, makes us Sterling. This relationship begins with our BDOs who are the first voice / face of Sterling that they are introduced to. They work so hard and do a fabulous job of representing who we are, and this relationship continues throughout underwriting, closing, and then into the RM world. The RMs and our Credit Team do a wonderful job continuing to foster this relationship going above and beyond for the Sterling client. It is truly a team effort throughout the Sterling organization. Together, we partner, we work, we collaborate, we transform, and we succeed. People first is kind of the moto that I live by. I grew up in a home with very selfless parents that taught us to always do the right thing and take care of others. I always felt that if I was a tenth of the parent that my parents are to me then my kids we would doing ok.
EVERYONE wants to feel that they have value and are important and that people care about who they are and what they do. I try every day to say something nice to the people in my life and to ask them how they are and what is happening in their world. Our clients are no different than the people in our lives. Sterling is a family owned company built out of love and respect and the desire to have a better life. We are no different than our clients. What People first means to me is the client IS the business. You have to build a relationship with your client to learn who they are, what their goals are, and how Sterling can help them get there. We have no idea what it takes to run their business. No idea the people that are counting on them to run a successful business. But, we can try to find this out by opening the communication with our clients. Once we learn to ask them questions and listen to their needs, then we at Sterling can try to find some solutions to help them get there. We are not a bank! Sterling is different because we care about our clients personally and professionally. I have learned that even the worst news to a client can come across so much better when you talk to a client on a personal level. When you speak to them with kindness and concern, they understand that you want what is best not only for their business but, for them as well. I am proud to be part of the Sterling family because we do live true to these words. The ultimate goal is to graduate a client from Sterling and celebrate their successes with them. These business relationships are not just business. We continue to celebrate with clients long after they leave and they will continue to refer new clients to Sterling as a business that cares about its clients and their future. All these things together show our clients (and future clients) that Sterling will go above and beyond what is needed. We treat people as people not a dollar sign and I think they appreciate that.